CHICAGO -- Travel conditions remained hazardous as a winter storm swept across much of the northern Great Plains Monday, with blowing and drifting snow forcing the closure of an airport and creating near-zero visibility on some roads. The National Weather Service in Bismarck, North Dakota, said a blizzard warning would remain in effect for most of the state into Monday afternoon or early evening. Severe whiteout conditions led to the closure of Minot International Airport, and the facility wasn’t expected to reopen until 3 a.m. Tuesday. The airports serving Fargo and Bismarck also listed flight cancellations on their websites. Winds gusting 40 mph to 50 mph associated with the storm in Minnesota led to delays and cancellations at Minneapolis-St. Paul International Airport. The South Dakota Rural Electric Association said more than 12,000 of its customers were without power Monday morning. In Nebraska, winds gusting up to 70 mph were cited for hundreds of power outages in central and eastern portions of the state on Sunday, although by Monday morning utilities reported that power had been restored to most customers. The North Dakota Transportation Department closed most of a 240-mile stretch of Interstate 94 Sunday night, from the Montana border to Jamestown. That stretch remained closed Monday. Portions of U.S. Highways 2, 52 and 281 were also closed because of snow, ice and “near zero visibility.” Motorists who drive past the roadblocks can be fined up to $250. Authorities in South Dakota shut down Interstate 90 from the Wyoming border to Chamberlain - a distance of about 260 miles. And the Rapid City Fire Department sent out its special tracked vehicle for the first time this season to help stranded motorists east of Rapid City. The National Weather Service said the storm system will start to weaken on Monday as it moves into Canada. “Heavy snowfall will diminish today, but strong winds will continue (to) create blowing snow and reduced visibilities in the Upper Midwest, the service said. On Monday morning, lines were getting long at Chicago’s Midway Airport as holiday travelers tried to make it home, CBS Chicago reported. The early morning fog in Chicago, and wind and snow in other destinations, kept some passengers on the ground. Things looked better later in the day -- after dozens of cancellations from overnight fog and from a ripple effect caused by winter storms in other parts of the country. 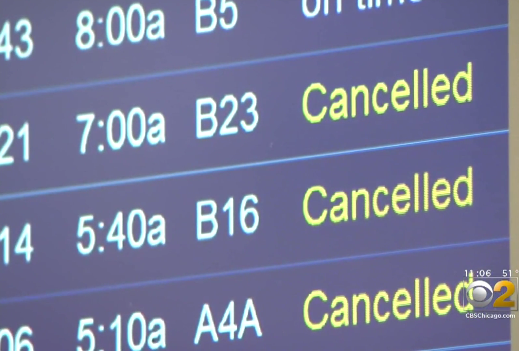 As of 11:40 a.m. Monday morning, Midway was reporting a total of 31 cancellations, with an average delay of less than 15 minutes. Chicago’s O’Hare Airport was reporting a total of 28 cancellations, also with an average delay of less than 15 minutes.